Helmut Ernst Huelsbergen died Thursday, January 5, 2017, at The Reflections Memory Care in Battle Creek, Michigan. A long-time resident of Lawrence, Dr. Huelsbergen moved to Michigan in 2013. He was born February 14, 1929 in Krefeld-Linn, Germany, to Anna te Kloot and Ernst Huelsbergen. He was raised and attended school in Germany. In 1949, Dr. Huelsbergen spent an academic year at Bethel College in Newton, Kansas, through an exchange program of the Mennonite Central Committee, returning to Germany in 1950 to complete his studies. He received a Ph.D. in English from the University of Cologne, Germany, in 1956. 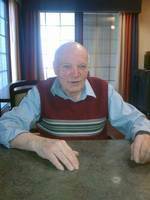 He began his teaching career in the German Department at the University of Kansas in 1958, retiring in 1994 after 36 years of service, which included a long tenure as department chairman. Dr. Huelsbergen's research interest included American neologisms of the 19th century, German Baroque literature, in particular the German poet Andreas Gryphius, and German mysticism. He was instrumental in establishing the German Summer Language Institute in Eutin, Germany, for the University of Kansas, spending many summers guiding college students through what was often their first experience of foreign travel and studying abroad. Dr. Huelsbergen served as the director of the Max Kade Center for German-American Studies at KU, and he was long-time editor of the Society for German-American Studies' "Yearbook of German-American Studies" published through the Max Kade Center. Dr. Huelsbergen had many interests outside of academia, including stamp collecting, gardening, playing chess, and researching family and other German-American genealogy with his wife. He married Ursula Arnold in 1962 and they had three sons: Lorenz, Anselm, and Benjamin. Dr. Huelsbergen is survived by his sons and by five grandchildren. He was preceded in death by his wife: Ursula and granddaughter: Olivia. No service is being held. The family suggests memorials to Lawrence Meals on Wheels in care of Warren-McElwain Mortuary.